This blog is a ministry of Christ Reformation Church. It began as Light for Dark Times and it’s original intent was focused upon teaching Christians what the Bible has to say about evil. Specifically, evil in local churches. That is still a very important mission of this blog. As you can see however, we have added “Christ Reformation Church” to the blog title and the reason we are doing so, and why we are making a few other changes, is that we realize we need to provide many of our readers with a church home. No, we aren’t trying to replace actual local churches, but the truth is that the condition of local churches today is, well, rather pathetic. And if you are a victim of domestic abuse (or other kinds of abuse) that occurred in the context of a local church, then you know that most churches on a street corner are simply not going to back you up. When it comes to having a church home, you end up homeless. As a result, many of you have mentioned to us that our blogs (including unholycharade.com) and the sermons we publish on sermonaudio.com/crc have become what you consider to be your church or at least a primary source of Christian fellowship. So we are responding and making some changes and additions here that we hope will enable you to feel more like you are a part of Christ Reformation Church – this little body of believers here in Tillamook, Oregon consisting of only about 30 people. YOU are an encouragement to us too! Including videos of the Sunday services which will be posted on sermonaudio.com/crc by Sunday evening each week (sermons in audio and PDF format are already published there weekly). Posting the Sunday morning order of service, including the hymn titles. Sermon Audio does not permit the inclusion of music, but you can find hymns online very easily, words and music. We promise there will not be any tele-evangelist mega-church wannabe gimmickry! Ha! CRC going mega. That’s a good one. Our sole purpose, for the glory of Christ, is to proclaim His Word, strengthen His people, expose the wicked, and help the widows and orphans of our day – the victims of wolves. We desire to be His true church living in obedience to Him and warmly welcoming all of you “out there” whose hearts are with Christ to come and be one in Him with us. One final note. 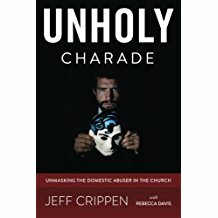 Today (Sunday, Feb 10) we publish the last of the Domestic Violence and abuse sermon series at unholycharade.com (the series will still remain available at sermonaudio.com/crc). Each Sunday morning beginning Feb 17 we will have a link to the PDF of that Sunday’s morning sermon here at CRC Light for Dark Times. And by Sunday evening we will add a link to a video recording. Next ›What Did Jesus Mean – “I go to Prepare a Place for You”? This is so wonderful Pastor Crippen, thank you!!! I’ve been without a church home and family for quite a few years and have felt so empty without them, but there was nowhere to go…but now there is, and I’m so grateful! Blessings to you and your very special ministry, and to all of your ‘true sheep’, whom you continually feed with such care and thoughtfulness…this is such a gift! You’re welcome Jessica. We are still developing the features of the site, the worship service and so on, learning as we go. Each week there will be our order of service posted along with at least words to hymns and sometimes links to online music for them. When we get the video recording of the sermon up and running we plan to include the communion service at the beginning of the sermon once each month. Each week as soon as I finish writing the sermon I put the PDF of it on sermonaudio.com/crc and then Sunday afternoon when I get back home I will upload the audio of the sermon. Thank you for putting this all together Pastor Crippen, it was so nice to be able to ‘attend’ your church this past Sunday, and everything worked so seamlessly…I’m looking forward to future Sundays with your congregation, and love the ability to revisit the service with it all being on line now, such a blessing! The pictures look great. It’s so fun to see the interiors of a church again. I didn’t realize just how badly I missed church until seeing the pictures. And it’s truly an invitation for church membership being offered, which is starting to sink in, and it’s really great. So great, Christ Reformation Church and Pastor Crippen and TWBTC! It’s again, so life-saving, this online presence, the sermons about DA/DV, the online community forum. I think this is the best possible use of the internet – share God’s Word and help support the most marginalized, encouraging probably the most despairing population, as abuse kills the person. I’m so proud to be a part of this ministry. I would like to believe that my blog posts calling Pastor Crippen my pastor and the fact that during my brick and mortar church services I pull out my phone to listen to Pastor Crippens messages or read from the blog instead of listening to the pastor right in front of me. You are an answered prayer. I prayed for years about how to approach evil in my neighborhood and church. Thanks to Pastor Crippen I found my voice. Pastor Crippen you helped me so much. I call you my Pastor because I’ve never had an accessible pastor. You’ve made yourself available on line to answer theological questions and spiritual delimmnas like no other pastor has helped me before. For that reason I’m a sharper sword to be used to stand up for righteousness on my job, in my church and ya know what people are drawn to me because of it. I 100% agree with you and so many others Stormy! I’m also proud to have considered Pastor Crippen my “Pastor” since I discovered his blog and sermons a couple of years ago because of the evil of abuse by professing “christians” that has been part of my life since my childhood and continued right up to present day-with an escalation to brutal, life-altering violence. I now eagerly await and absorb every word of his teachings. Then I read them again together with my husband, who has been abused by them as well. I keep most of them in a file and reread them when I feel the effects of the abuses and need to remind myself of how seriously the Bible takes the evil of the abuse I have always faced but accepted as my “worst possible luck” of birth into it, with no way out. I tried to just avoid my abusers more and more. My boundaries made the abuses escalate. I now know that is the signal of very dangerous unsafe people we must flee. I knew they were evil, but, because my abusers were “family” (both parents) and because they and my “christian” relatives, who witnessed the abuses all kept silent and covered it up, and because I am a Christian, I wrongly thought and was wrongly taught by false “christian” teachers and elders (who are among those accomplice relatives!) that I had to keep the peace, keep them in my life, keep accepting their constant manipulative, fake, unrepentant apologies. 77 times; 7X70 times…And that led to more unrepentant abuses. I did not know then that I was to have no association with them or their accomplices in their evil. ESPECIALLY because they all professed to be “christians” but were actually arrogant, brazen sinners, counterfeits, ravenous wolves and false teachers-hiding easily behind masks of “christianity”. Mocking God. A separate group the Bible addressed for me through you, Pastor. You gave me the knowledge and Scriptural basis to put an end to all association with my lifelong abusers/oppressors and even to hold them legally accountable finally. Fled from all the false teachers and all accomplices of evil too. Turned them over to God Who knows all their evil hearts and deeds. How your teachings have opened my eyes to “see” Bible truths that now have freed me, edified me and strengthened me through knowledge of relevant Scriptures and what they say about evil/abuse in general and evil/abuse within the church and what we as true Christians are told by God’s Word to do in response to these kinds of wolves in the church. Then add in Pastor’s real-life experiences with the evil of abuse by “christians” and his subsequent deep studies and into it and the wealth of wisdom that was the result that benefits us all now. His anointed ability to inform us victims of the tactics, mindset, schemes, mind games, bribing and manipulating of others by wearing their “christian sheep costumes” in public, their duping of and enlisting “christians” so easily as their allies in evil because its more convenient and less “costly” (for THEM) to cover it up, the many commonalities among abusers and their allies,…They are not as clever, original or special, as they THINK they are (in their distorted demon controlled minds), at all!! These have been LIFE-SAVING, LIFE-GUARDING and LIFE-GIVING teachings! Especially when we learn what the Bible says about the ETERNAL fate of these evil counterfeits. And what OUR eternal fate is. Our GOD Avenging THEIR evil done to us, HIS final Judgment of THEM, HIS true Justice and Righteousness. The fiery pit they face along with their leader satan. No more tears, pain, sorrows..Eternal Paradise FOR US!! The gratitude to God that I feel for His leading me to eventual healing through Pastor Crippen’s ministry and now my gratitude to his Christ Reformation Church members’ welcoming of us-“the online, formerly church-homeless true Christians”-as members of their church, has surely, as you and others have said, moved me to tears too. Lord God, I ask you to specially bless Pastor Crippen, his ministry and his church members for this welcoming, embracing, heartwarming invitation. Beautifully said. I’m so sorry to hear that the abuse came from your family. Absolutely horrific. I too reread Pastor Crippens sermons. I replay the one about God being on the side of the victim as the main abuser was a faux leader in a Christian group who groomed other members to side with him. I was painfully unofficially excommunicated. I thought God was punishing me! I thought God was against because that’s what it felt like. Thank you for posting. I will look forward to reading more of your posts now that I know your story. Thanks so much for being here. I feel the fellowship. Tears in my eyes as I type this. Thank you Stormy! Very kind words of comraderie. A blessed kinship forged by horrible experiences we all wish we hadn’t had happen to us. But God IS FOR US. He will be by our sides always through everything in this life. He will redeem our stories and give us beauty for ashes. We’ll get God’s Justice and our abusers will get theirs, maybe in this life or, for certain, in the next. I believe God will see to it that we’ll know each other when we meet in heaven! Love tears and hugs to you thank you so much! So Thank you, Pastor Jeff! You are very welcome, Aimee. It is my conclusion that 1 Corinthians 11 places the primary responsibility for taking the Lord’s Supper in a right and worthy manner upon the individual, not upon the local church to “fence the table” as it is often put. Of course we do not serve the elements to open, unrepentant hypocrites whose sin is arrogantly open as in 1 Cor 5, but the very narrow regulations many churches employ to protect the sanctity of the communion service are IMO misguided. Yes, we are to give the warnings given in Scripture such as in 1 Cor 11. But in the end it is the individual to whom the instruction “let a person examine himself” is given. And so I simply announce at the communion service that if anyone present is a Christian and has been baptized in Christian baptism, then they are welcome to participate. I add baptism because it is the other ordinance given us by Christ and it would seem to me that it is the means by which we openly confess Christ before men. My ex-church took concerns over whether one is worthy to take communion or not to the extreme. The pastor announced one Sunday that communion would no longer be served because it would be on his head when he stood before Christ if anyone took it unworthily. So in order to preserve his own self (in his mind) he took away a God-ordained ordinance from the rest of us. So glad to be out, even if it has been lonely up until now. HALLELUJAH!!!!! Praise God!!! this is the best thing I have heard in years! I have not had a church home for a while due to the apostasy. Then when the Lord led me to Pastor Crippen at Crying Out For Justice about four years ago, I was enlightened about the cruelty victims of abuse received at their “Home” church. I was not shocked to hear of this though with all of the very unbiblical practices I had witnessed at church, friends churches, and so called “revivals”. It will be a huge blessing for me to belong to this virtual church and be with like minded believers as I wait for the final trumpet to blow! Thank you, thank you Pastor Crippen! God led me to Pastor Crippen as well. Thank you for making this move. You, your sermons and encouragement have been a great help to me over the last two years. This new opportunity will help build connections and strengthen and many. Wonderful beyond words. After so many years of reaching out to help and aid victims of abuse – in all forms – now to see this open for them as the body of Christ, to come and gather together in spirit and find a place where they are safe to be free and worship and can learn about the goodness of God, instead of the spirital abuse most have suffered, is like a kiss from God. Someone told me, “so you have started a virtual church?” Yep!! Thats what it is! May God bless this ministry of hope, justice, and healing. May it truly continue to bring light for dark times. There is something so lovely in again being able to say (if only to myself) that I am a part of a church again. I didn’t think I’d ever be ‘church-homeless’ but I have been for multiple reasons, but now I can say I’m a part of such-and-such church. This is really great. And it really is a real church. A fellowship of believers. We will continue to develop various aspects of this online format as we gain more experience. But for now we are already interacting with one another, encouraging one another, hearing the Word preached, studying the Word through weekly articles, and as I said in our post we are planning to include the communion service portion as soon as we get the video gear up and running. Yes. That’s the really great thing. Not only is it a real physical church, but it’s a ‘vetted’ church, where the pastor gets it, the fellow believers are very well versed in abuse and most likely fellow survivors, and we’re here because we want to follow God, hear His Holy Word, worship Him each Sunday, and even participate in Holy Communion. I try to provide pertinent Scriptures during the communion service (which is part of our regular worship service). This helps everyone understand the scriptural doctrine of the Lord’s Table. I have tears in my eyes at the thought of actually belonging somewhere, and a sigh of peace in my heart. As I and my daughter(s) listen every Sunday to your sermons, I think of the people who heard the words of that particular sermon years ago and wonder how they are doing now. I feel honoured to be offered a place in your congregation even long distance, knowing you have all been though much yourselves through the years. Thank you, Jeff Crippen and congregation of Christ Reformation Church. Me too tears right now!! Every time the tears flow when I read this blog is because I’m being healed. Pastor Crippens messages, supportive affirming responses and the posts from participants are the Balm of Gilead. Praise God! It is like you read my mind! I have been thinking of emailing you to see if you would be a “virtual pastor” for my kids and me. Virtual pastor. I like it! Follow along with us here HopeGlenn and consider yourself part of us!! This is an answer to the prayers of many “church-homeless” Christians, including me! Imagine! A Pastor and a church that WELCOMES & MINISTERS TO the VICTIMS of the evil wolves instead of shielding and coddling the evil wolves. And which calls evil “EVIL” in whatever form it takes. Perpetrators, enablers, willfully blind, liars, oppressors of victims..Those who have harmed God’s children. The ones who have millstones & a fiery furnace waiting for them. Based always on God’s Word. Thank you for this, Pastor Crippen. Yes I experienced the evil wolves being coddled by the fake professing Christian crowd with disastrous outcomes on victims. Thank you Z.
I am so excited about this! Want to hear more details. This is what I need! Stay tuned, GladI’mout. We will keep everyone informed.